Three police officers were injured after a suspect grabbed a gun and opened fire inside the Gloucester Township police station in New Jersey early Friday, police said. 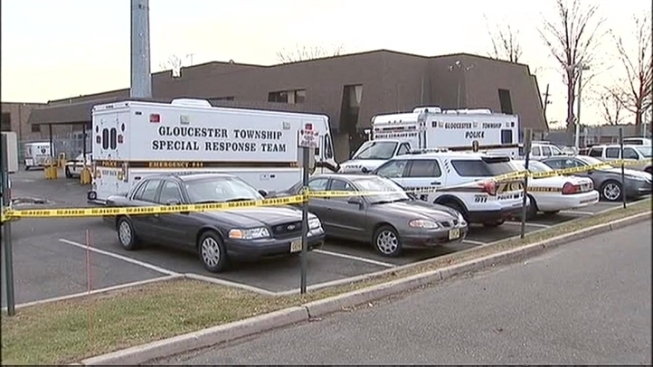 Police shot the gunman dead during the confrontation, Gloucester Township police said. Police say gunfire erupted inside the police station on Chews Landing Road at about 5:45 a.m. Friday as a man was being processed on a domestic violence complaint. "A violent struggle occurred while the suspect was being processed," Gloucester Township Deputy Chief David Harkins said. The suspect then grabbed a gun and opened fire. One of the officers was shot below his bulletproof vest. He underwent surgery at Cooper University hospital and is now listed in stable condition. A spokesperson for the hospital says that there were several puncture wounds in the officer's vest. The other two officers, a male and female, were treated for graze wounds and are set to be discharged Friday morning.